John Morow is a figure less significant for what he built than for what he represents: the opening up of Scottish architecture at a crucial juncture in its history to Continental influence. 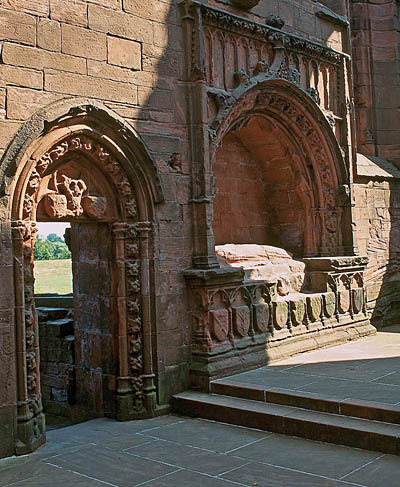 During the mid 14th century, the Anglo-Scottish wars inflicted damage on many of Scotland’s great churches and brought all major construction projects to a close. From the 1390s, however, there began a remarkable architectural revival in which the foundations of the late-Medieval tradition of Scottish buildings were being laid. Morow was intimately involved in this process, and his employment reflects the increasing influence of French (in preference to English) architecture in Scotland. All that is securely known of Morow’s career derives from an inscription in the great Cistercian Abbey at Melrose. This explains that he was born in Paris and had responsibility for ‘all the mason work of St Andrews, the high kirk of Glasgow, Melrose, and Paisley, of Nithsdale and Galloway’. Recent research, notably by Richard Fawcett and Christopher Wilson, has helped reveal something of his career. Apart from the recorded detail of his birth in Paris, nothing is securely known about the early life and training of Jean Moreau (as he was presumably first known). However, technical details in his attributed work suggest that he was familiar with a series of building operations that was undertaken by Charles V of France and his brothers between about 1360 and 1400. Among these operations were changes to the castle of Saumur, and it seems likely that Morow was directly involved with these: not only are there specific connections between Morow’s Scottish work and this building, but the architecture of that town seems to have been otherwise familiar to him. If Morow trained in the orbit of the French royal works under the king’s chief master mason, Raymond du Temple, he was nevertheless also aware of architectural developments further afield. His repertoire of window tracery patterns, for example, is also informed by the example of Peter Parler, the master mason of Prague Cathedral from 1352 and a vastly influential figure in Central European architecture. How and in what circumstances Morow came to Scotland is not clear, but the wide movement of senior masons is well documented throughout the Middle Ages. Likewise, there is evidence in 15th-century Scotland for the importation of other skills: records of a legal dispute in 1441 show that the monks of Melrose not only had their choir stalls made in Bruges, but they also expected the town’s master carpenter to come and install them. The inscription at Melrose suggests that Morow built a substantial practice much in the manner of contemporary senior masons in England: he was apparently retained by a group of major Church bodies as their professional advisor on building. It is still possible to identify what are probably fragments of his work at all but one of the places mentioned on the Melrose inscription: the cathedrals of Glasgow and St Andrews, the abbey of Paisley and the collegiate church of Lincluden (‘Nithsdale’). The reference to ‘Galloway’ is ambiguous, but possibly refers to Whithorn. All the securely identified buildings share technical similarities. Melrose, Paisley and Lincluden have similar curving tracery patterns, which are otherwise very unusual in Scotland. These include triangles with outwardly curved sides. Melrose, Lincluden and Glasgow, meanwhile, possess crouching sculptures of prophets. Similar figures are, again, otherwise unknown in Scotland, but common in French architecture of the time. Something of Morow’s high standing is powerfully suggested by the fact that he was permitted to leave such prominent memorials for himself in Melrose. It is not known when he died.